William Boyd McKechnie (August 7, 1886 – October 29, 1965) was an American professional baseball player, manager and coach. He played in Major League Baseball as a third baseman during the dead-ball era. McKechnie was the first manager to win World Series titles with two different teams (1925 Pittsburgh Pirates and 1940 Cincinnati Reds), and remains one of only two managers to win pennants with three teams, also capturing the National League title in 1928 with the St. Louis Cardinals. His 1,892 career victories ranked fourth in major league history when he ended his managing career in 1946, and trailed only John McGraw's NL total of 2,669 in league history. He was nicknamed "Deacon" because he sang in his church choir and generally lived a quiet life. McKechnie was born on August 7, 1886 to Archibald and Mary McKechnie, two Scottish immigrants who had settled in Wilkinsburg, Pennsylvania shortly before Bill was born. 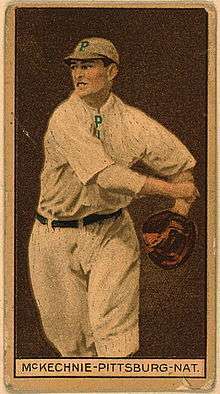 McKechnie made his major league debut in 1907 with the Pittsburgh Pirates, appearing in three games, before reemerging with the team in 1910 in a more substantial role. A utility infielder for the first half of his career before playing more substantially at third base later on, McKechnie played with the Pirates (1907, 1910–12, 1918, 1920), Boston Braves (1913), New York Yankees (1913), Indianapolis Hoosiers/Newark Peppers (1914–15), New York Giants (1916) and Cincinnati Reds (1916–17). His best offensive season came in 1914 with the Hoosiers, when scored 107 runs, batted .304 and stole 47 bases. In 1913, McKechnie had his worst season as a full-time player, batting only .134. However, Yankees manager Frank Chance thought McKechnie had a keen baseball mind, and had him sit next to him on the bench during games. Two years later, McKechnie got his first taste of managerial duties, when he served as player-manager of the Newark Peppers of the Federal League, leading the team to a 54–45 record. After he retired as a player, he managed for a year in the minors before assuming the helm of the Pirates in 1922. He managed the Pirates from 1922 to 1926, St. Louis Cardinals in 1928, St. Louis Cardinals again after they rehired him in 1929, Boston Braves from 1930 to 1937, and Cincinnati Reds from 1938 to 1946. He compiled 1,896 wins and 1,723 losses for a .524 winning percentage over his managerial career. His teams won four National League pennants (1925, 1928, 1939 and 1940) and two World Series championships (1925 and 1940), and he remains the only manager to win National League pennants with three different teams (Pittsburgh, St. Louis and Cincinnati). McKechnie's tenure in Pittsburgh came unraveled in 1926 when several of his players thought part-owner, vice president and de facto bench coach Fred Clarke was undermining him. Several of them thought Clarke was trying to regain the job he'd held from 1900 to 1915. Three veteran players—Max Carey, Carson Bigbee and Babe Adams—demanded Clarke's removal from the bench. McKechnie, who by inclination was a player's manager, initially appeared to support them. However, fearing that he'd be seen as opposing the ownership, he was forced to denounce his own players. Ownership struck fast and hard, releasing Bigbee and Adams and waiving Carey. The dispute cut the legs out from under the Pirates, who fell to third. McKechnie was fired after the season. The Cardinals finished the 1928 season in first place with a record 95 wins and 59 losses. They were swept in the World Series by the New York Yankees. McKechnie left the club after the World Series. Billy Southworth started the 1929 season with 43 wins and 45 losses. Gabby Street managed for a game before McKechnie returned as maanger. He finished the 1929 season with a record of 34 wins and 29 losses. McKechnie was not nearly as successful in Boston as he was at his other managerial stops, but he managed to finish "fourth or fifth with teams that should have been eighth." according to baseball historian Lee Allen. The only year in which the Braves did not even do moderately well during McKechnie's time as manager was in 1935, when Babe Ruth was with the team. According to Allen, McKechnie claimed that Ruth's presence made it nearly impossible to enforce discipline. Ruth drew a huge salary, and lived apart from the team on the road. Additionally, years of high living had rendered him a shadow of his former self. He couldn't run, and he made so many errors that three pitchers threatened to go on strike if he was in the lineup. Ruth lasted only about a month before retiring, and hit .181. Despite fielding essentially the same team that finished fourth a year earlier, the Braves won 38 games that year and lost 115—the worst record in modern National League history. According to one baseball reference work, McKechnie had a poor sense of direction, which did not improve when, as the Reds' manager, he began traveling by plane. He arrived in an airport when the Reds were to play the Pirates at Forbes Field. He hailed a taxi and asked the driver to take him to the Schenley Hotel. "I never heard of it", said the driver. McKechnie gave him the names of the nearby streets. "Never heard of them either", the cabbie said. "How long have you been driving a cab here? the manager asked. "Twenty-five years and then some", said the driver, "But so help me I never heard of the Schenley Hotel! You must be in the wrong town! Where do you think you are?" "Pittsburgh", McKechnie said. "Pittsburgh, hell!" retorted the driver. "You're really lost. This is Detroit!" McKechnie was an unusual kind of manager for his era. A very religious man, he didn't smoke, didn't drink, and didn't use profanity. When he had a problem player who was likely to go out carousing, McKechnie's simple solution was to room with him. After McKechnie ended his nine-year association with the Reds in 1946, he was hired as a coach to be the right-hand man of young Cleveland Indians manager Lou Boudreau. The Boudreau–McKechnie Indians won a World Series in 1948. 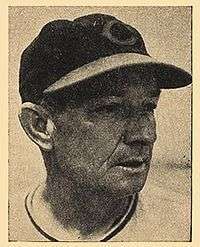 McKechnie coached with Boudreau for five seasons, with the Indians (1947–49) and Boston Red Sox (1952–53). McKechnie was inducted into the Baseball Hall of Fame in 1962 and into the Cincinnati Reds Hall of Fame in 1967. McKechnie died at age 79 in Bradenton, Florida. The Pirates' spring training home, McKechnie Field in Bradenton, is named after him. McKechnie's son Bill, Jr. was the farm system director of the Cincinnati Redlegs in the mid-1950s and later served as president of the Pacific Coast League, and he was also the father of former Syracuse radio station WNDR sportscaster Jim McKechnie. 1 2 James, Bill (1997). The Bill James Guide to Baseball Managers. Diversion Books. 1 2 3 4 5 "Bill McKechnie". Baseball Reference. Sports Reference LLC. Retrieved August 8, 2016. ↑ "1928 St. Louis Cardinals". Baseball Reference. Sports Reference LLC. Retrieved August 8, 2016. 1 2 "1929 St. Louis Cardinals". Baseball Reference. Sports Reference LLC. Retrieved August 8, 2016. 1 2 Allen, Lee. The National League Story. Hill & Wang, 1961. ↑ Neyer, Rob (2005). Rob Neyer's Big Book of Baseball Blunders. New York City: Fireside. ISBN 0-7432-8491-7. Koppett, Leonard (2000). The Man in the Dugout: Baseball's Top Managers and how They Got that Way. Temple University Press. p. 352. ISBN 9781566397452. Stinson, Mitchell Conrad (2012). Deacon Bill McKechnie: A Baseball Biography. McFarland & Company. p. 246. ISBN 9780786492367. Waldo, Ronald T. (2011). The Battling Bucs of 1925: How the Pittsburgh Pirates Pulled Off the Greatest Comeback in World Series History. McFarland & Company. p. 293. ISBN 9780786487899.